For the past few years I’ve been heavily involved in the Highland Literary Salon, a local writers’ group. A few months ago I stood down as chair of its committee after being in that role for two years, but still help out where I can. One such instance recently was where I chaired an event with guest author Richard Holloway as we discussed the craft of writing memoirs. As “homework” for this task I read his 2015 memoir Leaving Alexandria: A Memoir of Faith and Doubt, which I would like to review here. Anyway. Richard Holloway. If you’re Scottish you may have heard his name as he is, on top of a long career in the ministry, a noted author, speaker, journalist and activist in many creative and social spheres in Scotland. But his main claim to fame – notoriety, even – was his career as a clergyman in the Scottish Episcopal Church, including as Bishop of Edinburgh and latterly Primus, when his perceived liberal views on many social and sexual matters created controversy both within the church and beyond. Much has been said and written about Richard Holloway, not all of it especially kind, so here’s Wikipedia to fill you in on his biography. 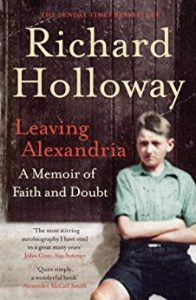 Leaving Alexandria isn’t strictly an autobiography – one of the points he made very strongly in his talk to the lit salon – as it misses out much in his life, focussing mainly on his journey of faith (and decline thereof). From his childhood in Alexandria, near Glasgow, through his teenage years at a religious order in England, and on through his years of ministry in England, Scotland and the USA, the book is a portrait of his work in often challenging circumstances. He writes powerfully about the social and economic difficulties of the communities he serves, such as deprived areas in Glasgow, and he deals with sympathy and sensitivity with the characters he portrays and the problems he encounters. One of the most powerful dimensions of the book – and a key cause of the controversy some saw in him – was his desire to reach out to gay people through his ministry, which began in the late 1950s when you can imagine social and theological views were very different from today. His account of this pioneering work is at its most poignant and powerful when he describes his work in the USA in the early 1980s when AIDS was just beginning to ravage the gay community and was doubly terrifying due to the ignorance and prejudice that surrounded it. The heartbreak, helplessness and rage that Holloway feels in the face of social and religious intolerance towards society’s weakest is palpable, and the writing is a compassionate balance of beautiful and angry. His emotional reaction is just as strong on the internal side, as the external, as he tracks his faith, and the various personal, theological and emotional battles locked up within it. It serves as a reminder that even the most senior clerical figures can be harbouring the deepest vulnerabilities, doubts and anguish despite how they may appear in public. Given the continuing lack of resolution and enduring hatred within the church over the issue of respect and love for LGBT Christians, Leaving Alexandria is a salutary reminder of the various forces at work and the way in which the debate can help to drive people away from the church – even some of its leading figures. That’s not to say that the book is dominated by the LGBT question. While it is one of its most powerful aspects, there is much else of interest in the book, for both the Christian reader (reflections on mission, the role of doubt, the nature of the church, and the interface of church and society) and others (the descriptions of childhood in Alexandria and work in Edinburgh and Glasgow in the 1950s and 1960s are evocative). Throughout Leaving Alexandria, Holloway’s skill as an author and compassion as a thinker shine through, and it is no wonder that he is one of Scotland’s most celebrated writers and journalists.